Mommy Digging Wednesday : Giveaway Hop : Time to link up your Giveaways! 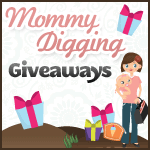 Welcome to the Mommy Digging Wednesday Giveaway Hop hosted by Mommy of Two Little Monkeys and Mommy Digger. I’m a new follower on GFC from the blog hop and I’m following you on twitter too.